Discovering places untouched by British Tourism is always an adventure. Time consuming journeys and battling language barriers is enough to put anyone off but in my search for family friendly paddling I think I’ve come up with the ultimate expedition adventure. I flew into Berlin on Friday afternoon and there was a taxi waiting for me to take me the two hour drive over the border to Poland. I was heading for the town of Skwierzyna in the Lubuskie district of western Poland. The area boasts over a hundred lakes and several large rivers yet doesn’t even get a mention in any Lonely Planet guides. So I arrived at this lovely little campsite just after 8pm to find a tent already put up for me and inside was a stove, a couple of bottles of water and to my surprise two cans of local beer, this was my kind of outfitter! There was also a 1:80,000 map of the area and a brief guide the River Obra, the main reason I had come here. The River Obra is over 165km long and travels through the heart of western Poland. The river starts near Babimost where it flows through several lakes then winds its way up to Policko, where my story begins. It was 10am on Saturday morning; I’d packed the tent away, sorted my kit out into dry bags and waited for Simon the Outfitter. Bang on time he arrived with what looked like a brand new boat on his roof-bars. I was so excited and very glad I hadn’t eaten breakfast as we drove, very quickly down dusty and extremely bumpy tracks to get to the river. As all my friends know, I have the silly spraydeck/ kayak fear thing going on and had been adamant on the phone to Simon before I left that I needed an open boat to do the trip. However, Simon kept saying, everyone who’d paddled this river before had always done it in a kayak and I really should consider it. 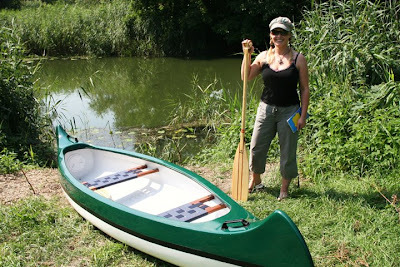 But I new best (well I thought I did) and he’d succumb and bought me a brand new Warthe Canoe. It was a lovely looking boat with moulded skegs front and back, all shiny and new. I loaded all my gear in, tent, food and water etc, had my map and GPS in front of me and said goodbye to Simon. We’d agreed a pick up point some 70km down river, where the River Obra joins the River Warta, and were to keep in regular contact by mobile phone throughout the trip. The paddle I was given I discovered quite quickly, was far too long for me but by modifying my stroke, to a pull and slice and never actually taking the blade out of the water, I managed ok. The temperature was high in the 80’s and the reeds on the edge of the river did little to shade me, so out came the tilly style hat (I was in the middle of nowhere, no one could see me) and a long sleeved shirt. The first few km of paddling where effortless. I was so chilled out. 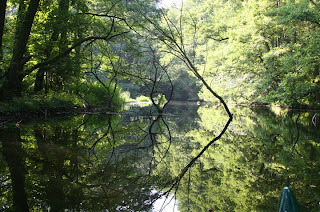 The river was like a forgotten millpond with incredible reflections on the water. There was a pair of young kingfishers darting to and fro in front of the boat and frogs leaping off lily pads as I floated by. By late afternoon I’d only paddled about 10km, mainly due to the lack of current, which I wasn’t expecting. By 5pm I had started looking for somewhere to camp for the night. Simon had said there were lots of places to pitch a tent but so far I hadn’t seen a get-out for a pee spot let alone somewhere to camp. I carried on further down the river and came to some sort of civilization. It was a huge building set in beautiful grounds and even had a picnic table next to the river. I should have jumped at the chance of camping here but the big building was actually an old asylum. This was the place where thousands of mentally ill and disabled people were euthanized under Hitler’s rule during the war. It is still used as an asylum to this day but obviously the regime has changed considerably by now. Although it looked like a perfect spot to camp I couldn’t help feeling uneasy and took the chance on finding another spot further along. It actually took another 4km to find one but it was worth it. It was a bit of a squeeze to pitch the tent on the tiny bank but I felt a lot safer and relaxed there. I took out my stove and made my favourite expedition meal, veg sausages and beans with instant mash potato. It tasted fantastic and it wasn’t long before I was tucked up in my bag and fell asleep. I did get woken up twice during the night by something rather large rustling around in the rubbish bag I’d left outside. I tried to see what it was but it ran off both times before I could undo the zip of the tent. The following morning I was up and on the river by 8.30am. Again it was an easy paddle reaching the town of Miedzyrzecz by late morning. There were lots of fishermen along the banks and they were all so friendly. My pigeon polish seemed to get me by as they wished me good morning and asked where I was from. Once through the town the river became slightly more challenging with fallen branches scattered about, which the skegs of my boat got stuck on every time. I didn’t mind until a couple of German day trippers on a plastic sit on top glided over the branches and overtook me. It was a little frustrating but I wouldn’t have got all my gear on a sit on top and they were only paddling a few km from one campsite to another. Apparently this stretch of river is very popular with Polish and German holidaymakers who hire the canoes from AdventurePoland.com or by the hour from the two campsites situated next to the river. As I left civilisation behind again the feel of the river completely changed. At first I couldn’t believe how stunningly beautiful this stretch of water was. It was like paddling through an enchanted forest with the sun glimmering through the trees and white tailed eagles calling to each other high in the sky. But the feeling soon changed from awe inspiring to quite scary. 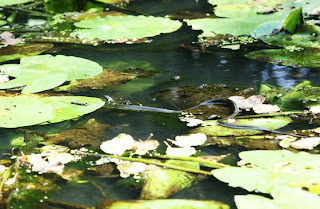 The frogs suddenly disappeared and snakes appeared in their place and were swimming in the water all around my boat. There were strange noises coming from the river bank as wild boar rustled their way through the long grass. I’d been told that Lynx and Wolves still roamed Poland so every noise filled my senses and I was constantly looking over my shoulder. 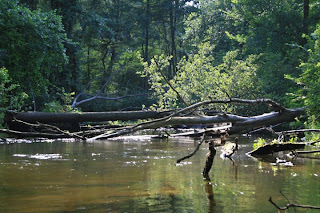 To make things even more interesting I was now paddling through an old untouched forest with fallen tree’s everywhere. The banks of the river where 15 metres high either side of me, so portaging just wasn’t an option. So with one eye on the snakes and another looking for things about to pounce from the trees above me I slowly dragged, pushed and prised my boat through the maze which lay before me. If only I had had a sit on top right now this would have been so easy. I think I’d have quite enjoyed chucking a virtually indestructible boat about in these conditions. But as it was I was terrified of ramming a hole straight through the fragile fibreglass shell of my canoe. I was finding this stretch of river quite tough just because I was on my own and the boat was quite heavy. However, I ploughed on and a few hours later, left the forest behind and was out in the blazing sunshine again. There was the odd tree down here too but I managed to guide my boat under most of them as I climbed over the top. By now it was getting quite late and I needed to reach the lake in time to pitch my tent before nightfall. I paddled hard and fast and almost missed seeing the beaver swimming just feet away from my boat. 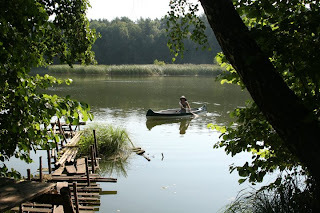 The canoe now came into its own and in no time at all the river merged into the beautiful lake of Bledzewskie. This is what the boat was designed for and according to my GPS I was travelling a good 11km an hour unlike the 2.4km I’d averaged through the forest. There were lots of happy voices and music coming from the woods around the lake but I didn’t see anyone. I found a nice spot in a pine forest to pitch my tent and watched a beautiful sunset go down over the water. Simon phoned to check I was ok and to see if I needed any food, water or even vodka dropping off. I’ve never met an outfitter who’d come and find you each evening and bring you beer, How cool is that? This would definitely entice a lot of my friends to come on expedition with me next time. The following morning I was up early again but spent some time exploring the woods. To my surprise I came across a triangular wooden shack which on further inspection turned out to be a proper toilet, not a flush one obviously but after 2 days of wild camping a hole in some wood and a pit was luxury. By 8am the lake was filling up with tiny fishing boats and the odd tandem kayak. I paddled out and met a lovely Dutch couple who were paddling on the lake and they kindly offered to take some photos of me for my article. Apart from Simon these were the only English speaking people I had met throughout the entire journey. Even the lady who owned the campsite I stayed in on the first night said (I think) she had never had an English person stay their before. So here I was on day three getting ready for the final stage of my trip. So far it had been an amazing trip even with the odd fallen tree to overcome. The scenery had been breathtaking and the wildlife incredible. I would happily take my family or even someone new to the sport on this stretch of the river but I would take Simons advice and take a kayak next time. As what they call kayaks aren’t what we call kayaks. Something has been lost in translation and their kayaks were poly-compound flat bottomed boats which have high sides but are not enclosed. Absolutely perfect for these conditions and I could have got all my gear in one! Ok so back to day three. This didn’t go quite according to plan. It’s a long story but Simon turned out to be the brother in law of the guy who dealt with the canoe side of the company, and had never been in a canoe in his life. Marcin (the canoe guy) who happened to be away on exped in eastern Poland had left instructions for Simon which somehow got mixed up. It turned out I should have been dropped off 60km further up the river and where I was now was where I should have finished. But I didn’t find this out until much later. So unaware what lay ahead I merrily paddled the last bit of the lake towards a large dam which I had to portage (with help from a lovely old German guy who took pity on me). I put in on the other side and I ended up having to paddle through some stinking water with dead fish floating about, it really wasn’t pleasant. But soon I was back on the river and the water was moving faster, not quite grade one but it was moving. I was getting quite excited thinking I could do the final 25km in no time at all. There were a few trees but soon I had open fields either side of me. Each field had a very tall wooden tower which I presumed where bird-watching hides. However, I later learnt these where for hunters to use in shooting deer and wild boar. I saw some black woodpeckers which I’d never seen before and even heard some corncrakes. Again it was another beautiful day without a cloud in the sky and I was quite sad that this would be my last day on the water as I was enjoying it more than any other trip I’d ever done. I’d paddled another couple of km when I came across what looked like a broken down old bridge. It took me ages to get my boat to the other side. I had to jump on the front of the canoe to push it down far enough to get under struts then climb back over the bridge, jump on the other end to get that end under. It was actually quite dangerous as the bridge felt like it would snap into pieces beneath me as I climbed back over. The next km of river was lovely until the trees started to get thicker and I found myself paddling under a thick canopy of branches. It was quite dark under there and the temperature dropped considerably. I’d only gone a few hundreds yards when I saw my first beaver downed tree. These weren’t normal trees, like the other ones had been, these where giants. Some of them were well over a metre wide and they easily spanned the entire river. I dragged my boat over the first one and as I stood on a semi submerged trunk I looked ahead and all I could see was tree after tree blocking my route. My heart sank, it had been hard enough just getting over this one but I could see at least another 20 in front of me. So I took a few deep breaths and struggled on. Each tree was taking a good ten minutes to get over and by lunch time I was shattered. I was starting to feel like I’d never get out of there; in my mind it had became a psychological endurance test between me and the river. Everywhere I looked I was surrounded by fallen trees. There was no going back and there was no getting out so I had to carry on. I was so tired I’d started being clumsy and banged my head quite badly on broken branches I hadn’t seen. Some of the trees I managed to squeeze through. I’d have to lie flat on my back in the boat and drag myself under using my arms. I stupidly tried to do this under two trees at the same time and got stuck half way. It was terrifying. 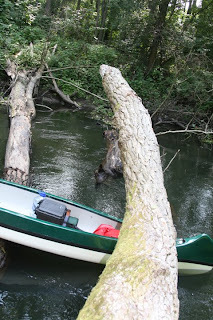 I couldn’t get up, my body was pressed between the boat and the underside of the two fallen trees and the boat was jammed against another branch. I could feel the rough bark digging into my chest. I could move my arms but the claustrophobic panic was starting to kick in. I couldn’t even reach my mobile phone to call for help. How I got out of that I don’t know. But someone must have been looking down on me from somewhere as I eventually managed to wiggle my way free. My face and chest were cut and scratched and my hands and knees where bleeding but I was ok. I was quite shook up though and sat for what seemed like hours on top of the next fallen tree trying to work out what to do next. I thought about calling Simon for help, even with the 15 meter high banks he could have found me with his GPS and he is really into his 4x4 off-roading and even runs expeditions by landrover so I’m sure he could have reached me some way or other. But that would be giving up and I didn’t want to do that, so I determinedly carried on. Every now and again I’d stop, have a mouth full of red jelly babies and wait for the sugar rush to give me the energy to get over the next tree. My next problem arose when the river split into two. It didn’t on my map but in front of me I had to make the decision. The water was running evenly into both channels and they both had fallen trees blocking the way as far as the eye could see. I didn’t have a clue which way to go. I chose to go right and prayed I wouldn’t find it to be a dead end a few km further down the river. One of the yuckiest moments was when I crouched down to get under another tree which didn’t look too bad and half way through I noticed this huge slimy fungus growing underneath which spread yellow foul smelling goo all in my hair and down my back. Not a nice sensation. By 5pm I had had enough of all this hard work and truly wanted to cry. I’d been dragging my boat over and under trees for the best part of 8 hours solid. My hands were sore and my whole body was aching. My map was telling me I should have reached my get out point 2km back and I was starting to worry I’d missed it. By 6pm I started to hear traffic and soon I was manoeuvring my way under a big yellow and blue bridge which wasn’t on my map. I phoned Simon to see if I was anywhere near where I should be but he didn’t have a clue which bridge this could be. He offered to find me using the GPS but I said I’d carry on a little further as I still had an hour or so of daylight left. The river didn’t let up and I endured another 7km of fallen trees before I finally reached my pick up point. As soon as I saw the get out spot my body instantly gave up. I could hardly move my arms and didn’t have the strength to stand. I dragged myself onto the bank and just lay there totally and utterly exhausted. It wasn’t long before I heard the sound of Simon’s 4x4 driving down to the river. It was only then that it hit me that I’d done it. I had successfully done what we think is the first ever British Solo decent of the River Obra by canoe. The boat was a mess. Three days earlier it had been brand new and shiny, now it was scratched all over, chunks missing out of the side, gauge marks on the top and absolutely filthy. If I’d known what the river was like I would have never taken that boat down there. In fact if I’d listened to Simon and took what they call a kayak down it would have been a completely different trip. Also thinking about it, it had been a hot summer and the water levels where lower than usual so that could have made things a little harder than usual too. So to summarise, the river it spilt into three sections. The first from Trzciel to Meidzyrzec is easy and relaxing, even your Gran could manage this bit. The second section between Meidzyrzec and Bledzew is definitely trickier but ideal for a real family adventure. I found this bit to be the most enchanting stretch of river I have ever paddled. Even the photographs which are stunning still don’t quite capture the absolute magnificence and splendour of this unique stretch of river. The final part of the river from Bledzew to where it meets the Warta in Skwierzyna is definitely not for the faint hearted. It only takes a day but it’s a hell of a day! Taxi: 220 zlotes which is roughly £45 (cheap considering its well over a 100km drive) but you could get a train or bus for a fraction of that price. Or you could take your own car and drive the entire way; it’s only an 11 hour drive from Calais. Adventure Poland have an English speaking guide. They can arrange drop off’s and pick ups at the start and end of every day if you prefer to stay in a guest house or hotel. 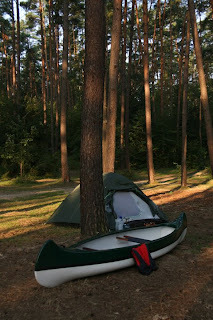 They can also arrange to drop off fresh food and water and even Polish vodka for you at your campsite in the evening. They also run 4x4 expeditions and do cycle hire. A big thanks to Simon for everything. To Roman who let me sample the local delicacy of Pierogi, to Pyranha for giving me an ace River dry bag for the journey, to Max who spent 3 hours over the phone teaching me how to use my GPS and finally to my mum and my hubby for not going too ballistic with me when they realised on day two I was doing a solo decent. Earning money online never been this easy and transparent. You would find great tips on how to make that dream amount every month. So go ahead and click here for more details and open floodgates to your online income.